Solar Dynamics Observatory (SDO) keeps a 24-hour eye on the entire disk of the sun, with a prime view of the graceful dance of solar material coursing through the sun’s atmosphere, the corona. The video shows six years – from Jan. 1, 2015, to Jan. 28, 2016, as one time-lapse sequence. Watch the magnetic fields in HD and get the explanations in the second part of the video – terrific work by the NASA Goddard Space Flight Center! NASA employee Adam Voiland collected satellite images from clouds and landscapes that (more or less) look like letters from our alphabet. I am pretty sure this is going to be helpful one day. 3.375.746 journeys resulted in 500.000 routes from all across the continent…and there is an interactive map that is showing all of it. The people from movel.lab aligned starting points in a 26.503.452 km² grid covering all of Europe. Every cell of this grid contains the starting point to one of our journeys to Rome. They’ve done the same with other cities as well, very interesting and well done. Vastly covered, nevertheless impressive engineering by the Blue Origin team that managed (in contrary to SpaceX) to bring back a rocket in one piece. “The Shepard space vehicle reached thee edge of space at a suborbital altitude of 100.5 kilometers. The capsule then separated and touched down beneath a parachute but the BE-3 rocket also started its own descent. After the rockets fired at nearly 5,000 feet, it made a a controlled vertical landing at a gentle 4.4 mph.” Wicked! The Solar Dynamics Observatory (SDO) captures images of the Sun in 10 different wavelengths, each of which helps highlight a different temperature of solar material. This video (4K) presents the nuclear fire of our life-giving star in intimate detail, offering new perspective into our own relationships with grand forces of the solar system. NASA, NASA and again NASA – yes but who else is up there…watch it full size and in max resolution. Oh yes, it is an effervescent tablet dissolving in a floating ball of water…in space. 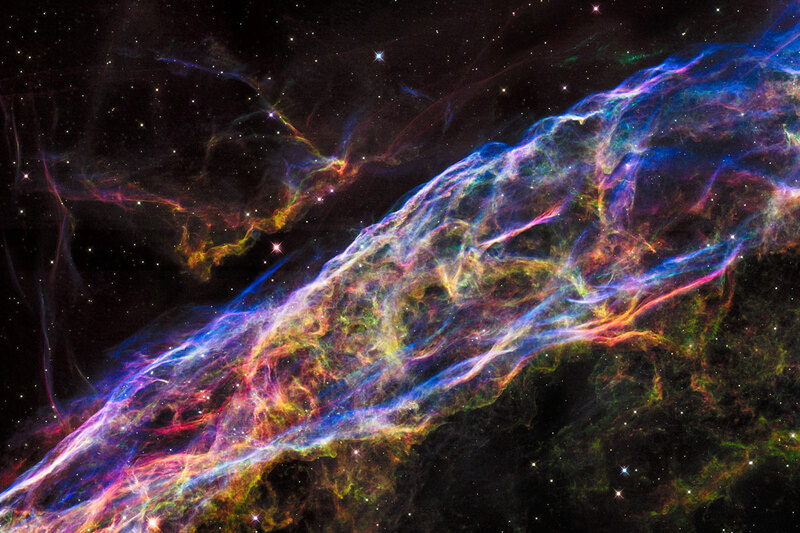 A fantastic new image of the Veil nebula showing its expansion after the explosion over the past years. 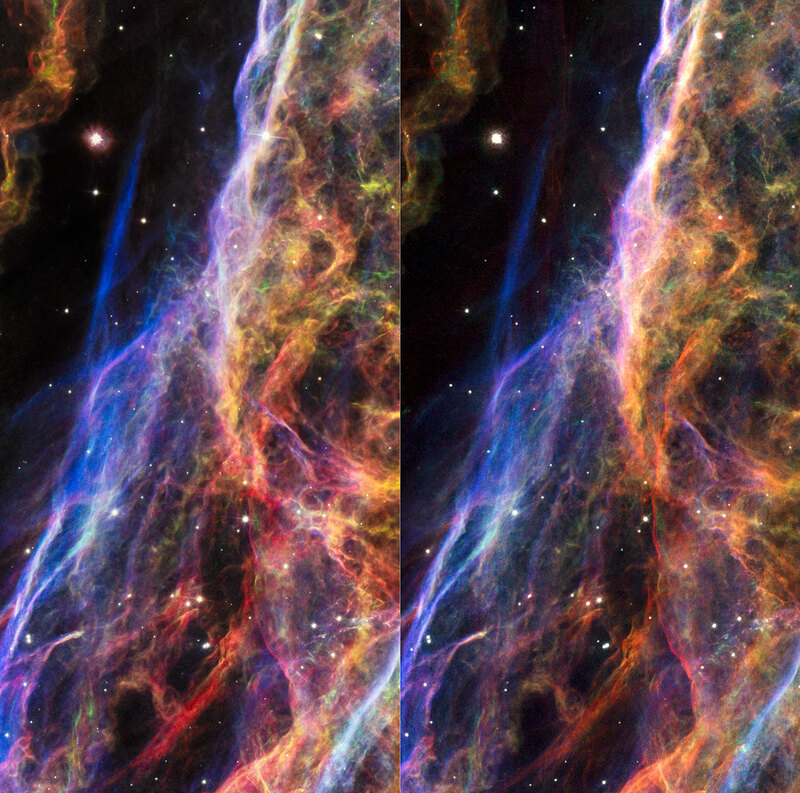 What you see is gas in different densities and temperatures, click here for the full explanation. 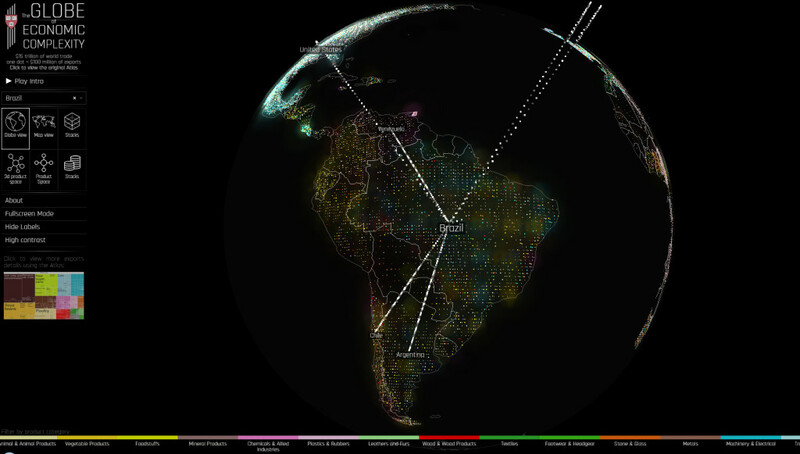 Harvard’s Owen Cornec created a map that lets you explore Earth’s economic relationships in details – and, it is beautiful . One dot equals $100M of exports, just click around or check the video for more explanation. Cudos mister Cornec! Forget CERN, the science fiction is here (compare with the movie Event Horizon): Super-Kamiokande, a neutrino observatory built 1993-1996 and located under Mount Kamioka in Japan. The observatory is designed to search for proton decay, study solar and atmospheric neutrinos, and keep watch for supernovae in the Milky Way Galaxy. The Super-K is located 1,000 m underground and consists of a cylindrical stainless steel tank that is 41.4 m tall and 39.3 m in diameter holding 50,000 tons of ultra-pure water. Check out the website for more details and more pictures.